We are but 2 days away from this years edition of the Crosstown Shootout. With no more pesky games left with other local rivals, all we have to concentrate on now is Xavier. Xavier lost of one of Bob Huggins' old squads on Tuesday, and I think it's agreed we would all like to see that happen again Sunday night. But that won't be easy. The next man up on the Xavier hate list, following Tyrone Hill and David West, is one of the backcourt players that ruined my childhood. 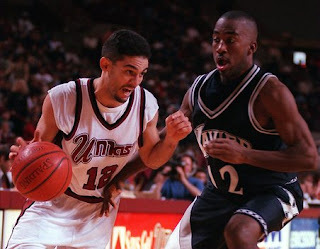 It seemed this man played at Xavier forever, and his only job was to make me hate him, and his stupid sounding name. The next man up is Gary Lumpkin.